The death toll from the most powerful earthquake to hit Ecuador in over 30 years tripled to 233 as a state of emergency was declared and rescue operations continued, the nation's president said Sunday. 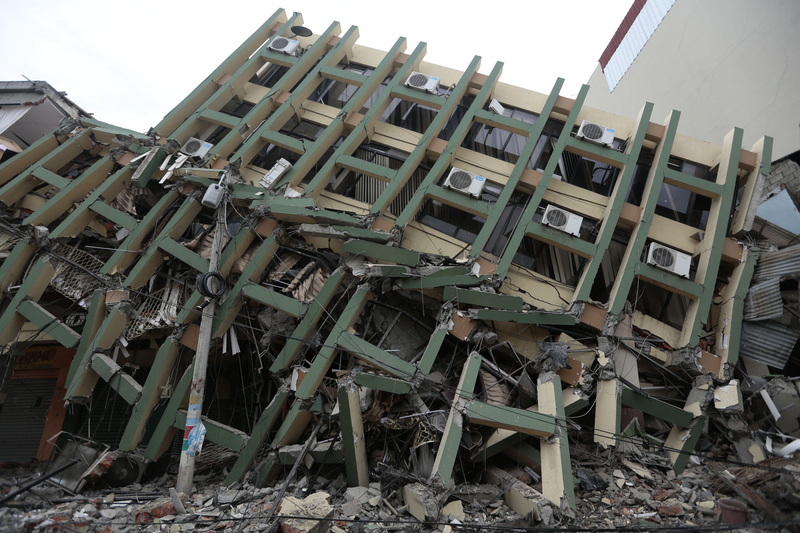 A 7.8 magnitude earthquake struck near Ecuador's coast Saturday evening, reducing buildings and highways to rubble and cutting off power in some cities. Ecuadorian President Rafael Correa announced via Twitter that rescue authorities had confirmed at least 233 people had been killed in the quake. "The immediate priority is to rescue people in the rubble," he tweeted in Spanish. Correa had cut short his attendance at a Vatican conference in Italy to return to Ecuador on Sunday as 10,000 troops and 3,500 police were deployed to assist with rescue operations. "Thank you to the whole world for solidarity," he said in a tweet. A state of emergency was declared Sunday in six of the Andean nation's 24 provinces as more than 130 aftershocks continued to rock towns and ports along Ecuador's coast, NBC News reported. Saturday's 7.8 magnitude quake, which struck just off the coastline some 105 miles northwest of Ecuador's capital city Quito, is the strongest earthquake to hit the country since 1979 when an 8.2 magnitude quake reverberated across Ecuador and Colombia. "These are very difficult moments," USA Today reported Ecuador's Vice President Jorge Glas said Sunday. "We have information that there are injured people who are trapped [under rubble] in different districts and we are getting ready to rescue them." At least 1,500 people have reportedly been injured, authorities said. Officials in the coastal canton of Pedernales in Manabí Province issued desperate pleas for emergency aid and equipment to assist rescue workers after Saturday's earthquake and its aftershocks had devastated much of the area, with numerous people trapped inside buildings reduced to rubble in the tremor. "There are villages totally devastated," Reuters reported Pedernales' mayor Gabriel Alcivar said in an interview with a local radio station. "What happened here in Pedernales is catastrophic." A field hospital was being sent to Pedernales to temporarily assist with treating injuries as workers worked through the night to pull survivors from the rubble, the Los Angeles Times reported. Ecuador's quake comes on the heels of two earthquakes — one 6.5 magnitude and one 7.0 magnitude — that struck near Kumamoto, Japan on Thursday and Saturday. Both Ecuador and Japan lie along the so-called "Ring of Fire," a horseshoe-shaped stretch of seismically active regions along the basin of the Pacific Ocean where numerous earthquakes and volcanic eruptions occur. The U.S. Geological Survey, however, does not believe the tremor in Ecuador is related to those that rocked Japan.